TIME TO SCREAM once again as one of our favourite designs get a new colourway! first seen at Thailand Toy Expo 2018 HERE. Its now time for the online AP release! 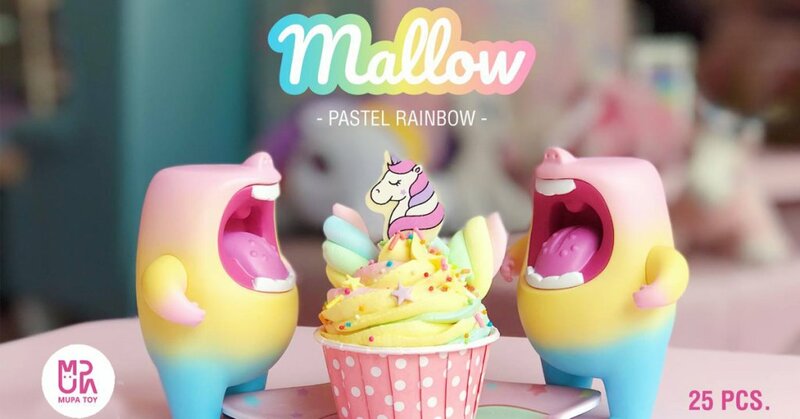 Drumroll please, MUPA TOY “MALLOW” vinyl PASTEL RAINBOW edition is set to be released. Not going get any more vibrant than this version, right? As much as you want to eat it and treat it like candyfloss it’s not edible so let that be a word of warning. – MUPA will announce when Mallow is SOLD OUT. After that we will message you for reservation confirmation. Have you seen the checklist?! sneak peek at whats coming. You’ll get your Mupa Toy news first when you download the TTC Mobile App. Designer Toy news direct to your smartphone, for FREEEEE!